Wideopen Magazine Team rider Veronique Sandler is a NZ rider currently living in the UK with the goal of getting out riding and filming as much as possible. As well as being a rider for the UK’s Wideopen Magazine, Vero will be competiting in as many events as she can – mainly the British Downhill Series and a few World Cups! This girl is one to watch out for!!! We caught up with Vero during her stay with us at Le Cottage for an epic day riding the trails of Morzine’s Super M and Pleney! Talk us through your history with Morzine, why you come here and what you like about it? I’ve been hitting Morzine since 2012 now and can’t go a year without it. It used to be my base while I was over in Europe racing the World Cup season, but now that I live in the UK it’s just turned into a sick yearly riding holiday! 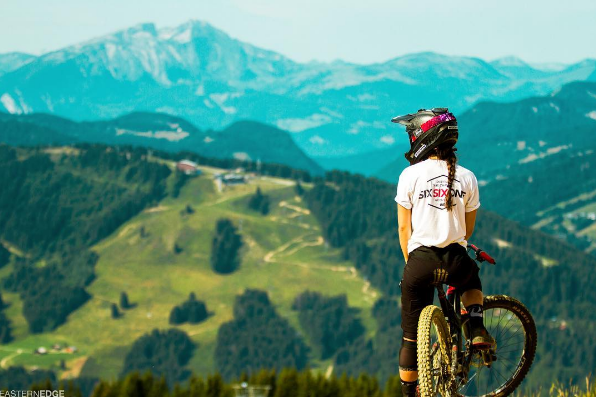 Favorite place to ride in the Portes du Soleil and why? Although there are so many amazing spots, Pleney is always my fave. The steep loamy tracks are too good to compare with anything else! It’s my favourite type of riding for sure! Hows the Cottage treating you, have you met the croc yet? The cottage has been amazing, there’s no better place to be situated in Morzine and the bacon egg breakfast sandwiches are unreal! Waking up at the Cottage, basically on the Pleney, whats the first Pleney track you think about each morning? That new super steep, loamy track (GC) is always on my mind. It’s so fun but also so steep and scary all at once! A 12th at Fort William this year, hell of a result, will we be seeing you at more world cups in the future? Yea for sure! I’ve been on the circuit since 2012 but took a bit of a step back from racing this year to focus on media, and have somehow been pulling off better results than ever, so I’ll definitely do a couple every year. Your sponsors Wideopen Mag seem to have a habit of spotting talent early in riders careers, nurturing it and pushing riders forward, with the likes of Laurie Greenland, Taylor Vernon and Mark Scott all going on to big things, what does the future hold for Vero? Yea they have killed it on that front! For me, I’d like to become a professional rider through media content and racing, and hopefully inspire other girls to get rad through my videos. One piece of essential riding gear you never hit the trails without? Tell us a bit about your bikes, do you prefer the DH bike or the enduro bike? To be honest, I love them both so much and can’t compare them. Riding in the UK is definitely sick on a trail bike, but then I really enjoy hitting big jumps and riding rough stuff over here on the big bike, so it just depends on the vibe of the place really! Whats the plan for the rest of the season, next trip, race etc? My next race is Llangollen BDS, and then I’m off to my favourite country ever, Norway, to film a video… excited! A kiwi that’s moved to Bristol seems like the wrong way round for most of us Brit’s, what was the draw of the UK, how’s it working out for you and how does the riding compare? Haha I literally get told this every day, but I love the UK! I think it’s a lot easier to make it as a professional rider over here as the support is much better and everything is more accessible. Also, it’s so sick how hyped people always are to go riding, and though the hills might not be huge, the tracks are built so well and everyone is always having fun on them. Top tracks for the track, what are you listening to right now? I’ve been jamming NZ reggae band Fat Freddy’s Drop a lot this summer, it always gets me stoked! A huge good luck to Vero in all her up coming races and a big thanks for taking us riding!